Typically, insects which generate allergic responses are either stinging insects (wasps, bees, hornets and ants) or biting insects (mosquitoes, ticks). Stinging insects inject venom into their victims, whilst biting insects normally introduce anti-coagulants. There are differences between countries in the number of individuals within a population having allergies. Allergic diseases are more common in industrialized countries than in countries that are more traditional or agricultural, and there is a higher rate of allergic disease in urban populations versus rural populations, although these differences are becoming less defined. Several medications may be used to block the action of allergic mediators, or to prevent activation of cells and degranulation processes. These include antihistamines, glucocorticoids, epinephrine (adrenaline), mast cell stabilizers, and antileukotriene agents are common treatments of allergic diseases. Anti-cholinergics, decongestants, and other compounds thought to impair eosinophil chemotaxis, are also commonly used. Although rare, the severity of anaphylaxis often requires epinephrine injection, and where medical care is unavailable, a device known as an epinephrine autoinjector may be used. Atopic eczema About 9% of the population. Between 1960 and 1990, prevalence has increased from 3% to 10% in children. 5.8 million (about 1% severe). Some signs and symptoms attributable to allergic diseases are mentioned in ancient sources. Particularly, three members of the Roman Julio-Claudian dynasty (Augustus, Claudius and Britannicus) are suspected to have a family history of atopy. The concept of "allergy" was originally introduced in 1906 by the Viennese pediatrician Clemens von Pirquet, after he noticed that patients who had received injections of horse serum or smallpox vaccine usually had quicker, more severe reactions to second injections. Pirquet called this phenomenon "allergy" from the Ancient Greek words ἄλλος allos meaning "other" and ἔργον ergon meaning "work". ^ a b "Environmental Allergies: Symptoms". NIAID. 22 April 2015. Archived from the original on 18 June 2015. Retrieved 19 June 2015. ^ a b "Types of Allergic Diseases". NIAID. 29 May 2015. Archived from the original on 17 June 2015. Retrieved 17 June 2015. ^ a b c d Kay AB (2000). "Overview of 'allergy and allergic diseases: with a view to the future'". British Medical Bulletin. 56 (4): 843–64. doi:10.1258/0007142001903481. PMID 11359624. ^ a b c d e National Institute of Allergy and Infectious Diseases (July 2012). "Food Allergy An Overview" (PDF). Archived from the original (pdf) on 5 March 2016. ^ a b Bahna SL (December 2002). "Cow's milk allergy versus cow milk intolerance". Annals of Allergy, Asthma & Immunology. 89 (6 Suppl 1): 56–60. doi:10.1016/S1081-1206(10)62124-2. PMID 12487206. ^ a b c d Sicherer SH, Sampson HA (February 2014). "Food allergy: Epidemiology, pathogenesis, diagnosis, and treatment". The Journal of Allergy and Clinical Immunology. 133 (2): 291–307, quiz 308. doi:10.1016/j.jaci.2013.11.020. PMID 24388012. ^ a b c d e f g h i j "Allergen Immunotherapy". 22 April 2015. Archived from the original on 17 June 2015. Retrieved 15 June 2015. ^ a b c Simons FE (October 2009). "Anaphylaxis: Recent advances in assessment and treatment" (PDF). The Journal of Allergy and Clinical Immunology. 124 (4): 625–36, quiz 637–38. doi:10.1016/j.jaci.2009.08.025. PMID 19815109. Archived from the original (PDF) on 27 June 2013. ^ Finn, DF; Walsh, JJ (September 2013). "Twenty-first century mast cell stabilizers". British Journal of Pharmacology. 170 (1): 23–37. doi:10.1111/bph.12138. PMC 3764846. PMID 23441583. ^ May, JR; Dolen, WK (December 2017). "Management of Allergic Rhinitis: A Review for the Community Pharmacist". Clinical Therapeutics. 39 (12): 2410–19. doi:10.1016/j.clinthera.2017.10.006. PMID 29079387. ^ a b "Allergic Diseases". NIAID. 21 May 2015. Archived from the original on 18 June 2015. Retrieved 20 June 2015. ^ a b c McConnell, Thomas H. (2007). The Nature of Disease: Pathology for the Health Professions. Baltimore, MD: Lippincott Williams & Wilkins. p. 159. ISBN 978-0-7817-5317-3. Archived from the original on 8 September 2017. ^ "How Does an Allergic Response Work?". NIAID. 21 April 2015. Archived from the original on 18 June 2015. Retrieved 20 June 2015. ^ Cox L, Williams B, Sicherer S, Oppenheimer J, Sher L, Hamilton R, Golden D (December 2008). "Pearls and pitfalls of allergy diagnostic testing: report from the American College of Allergy, Asthma and Immunology/American Academy of Allergy, Asthma and Immunology Specific IgE Test Task Force". Annals of Allergy, Asthma & Immunology. 101 (6): 580–92. doi:10.1016/S1081-1206(10)60220-7. PMID 19119701. ^ Wheatley LM, Togias A (January 2015). "Clinical practice. Allergic rhinitis". The New England Journal of Medicine. 372 (5): 456–63. doi:10.1056/NEJMcp1412282. PMC 4324099. PMID 25629743. ^ Thomsen SF (2014). "Atopic dermatitis: natural history, diagnosis, and treatment". ISRN Allergy. 2014: 1–7. doi:10.1155/2014/354250. PMC 4004110. PMID 25006501. ^ "Global Strategy for Asthma Management and Prevention: Updated 2015" (PDF). Global Initiative for Asthma. 2015. p. 2. Archived from the original (PDF) on 17 October 2015. ^ "Global Strategy for Asthma Management and Prevention" (PDF). Global Initiative for Asthma. 2011. pp. 2–5. Archived from the original (PDF) on July 2016. ^ Leslie C. Grammer (2012). Patterson's Allergic Diseases (7 ed.). ISBN 978-1-4511-4863-3. Archived from the original on 8 September 2017. ^ Anandan C, Nurmatov U, van Schayck OC, Sheikh A (February 2010). "Is the prevalence of asthma declining? Systematic review of epidemiological studies". Allergy. 65 (2): 152–67. doi:10.1111/j.1398-9995.2009.02244.x. PMID 19912154. ^ Bope, Edward T.; Rakel, Robert E. (2005). Conn's Current Therapy. Philadelphia: W.B. Saunders Company. p. 880. ISBN 978-0-7216-3864-5. ^ Holgate ST (March 1998). "Asthma and allergy--disorders of civilization?". QJM. 91 (3): 171–84. doi:10.1093/qjmed/91.3.171. PMID 9604069. ^ Rusznak C, Davies RJ (February 1998). "ABC of allergies. Diagnosing allergy". BMJ. 316 (7132): 686–89. doi:10.1136/bmj.316.7132.686. PMC 1112683. PMID 9522798. ^ Golden DB (May 2007). "Insect sting anaphylaxis". Immunology and Allergy Clinics of North America. 27 (2): 261–72, vii. doi:10.1016/j.iac.2007.03.008. PMC 1961691. PMID 17493502. ^ Schafer JA, Mateo N, Parlier GL, Rotschafer JC (April 2007). "Penicillin allergy skin testing: what do we do now?". Pharmacotherapy. 27 (4): 542–5. doi:10.1592/phco.27.4.542. PMID 17381381. ^ a b c Tang AW (October 2003). "A practical guide to anaphylaxis". American Family Physician. 68 (7): 1325–32. PMID 14567487. ^ Brehler R, Kütting B (April 2001). "Natural rubber latex allergy: a problem of interdisciplinary concern in medicine". Archives of Internal Medicine. 161 (8): 1057–64. doi:10.1001/archinte.161.8.1057. PMID 11322839. ^ Muller BA (March 2004). "Urticaria and angioedema: a practical approach". American Family Physician. 69 (5): 1123–28. PMID 15023012. ^ a b Ludman SW, Boyle RJ (2015). "Stinging insect allergy: current perspectives on venom immunotherapy". Journal of Asthma and Allergy. 8: 75–86. doi:10.2147/JAA.S62288. PMC 4517515. PMID 26229493. ^ Grammatikos AP (2008). "The genetic and environmental basis of atopic diseases". Annals of Medicine. 40 (7): 482–95. doi:10.1080/07853890802082096. PMID 18608118. ^ a b c d Janeway, Charles; Paul Travers; Mark Walport; Mark Shlomchik (2001). Immunobiology; Fifth Edition. New York and London: Garland Science. pp. e–book. ISBN 978-0-8153-4101-7. Archived from the original on 28 June 2009. ^ a b "Asthma and Allergy Foundation of America". Archived from the original on 6 October 2012. Retrieved 23 December 2012. ^ a b Maleki, Soheilia J; Burks, A. Wesley; Helm, Ricki M. (2006). Food Allergy. Blackwell Publishing. pp. 39–41. ISBN 978-1-55581-375-8. ^ Boyle RJ, Ierodiakonou D, Khan T, Chivinge J, Robinson Z, Geoghegan N, Jarrold K, Afxentiou T, Reeves T, Cunha S, Trivella M, Garcia-Larsen V, Leonardi-Bee J (March 2016). "Hydrolysed formula and risk of allergic or autoimmune disease: systematic review and meta-analysis". BMJ. 352: i974. doi:10.1136/bmj.i974. PMC 4783517. PMID 26956579. ^ Järvinen KM, Beyer K, Vila L, Bardina L, Mishoe M, Sampson HA (July 2007). "Specificity of IgE antibodies to sequential epitopes of hen's egg ovomucoid as a marker for persistence of egg allergy". Allergy. 62 (7): 758–65. doi:10.1111/j.1398-9995.2007.01332.x. PMID 17573723. ^ "World Allergy Organization". Archived from the original on 14 April 2015. Retrieved 13 April 2015. ^ Herman EM (May 2003). "Genetically modified soybeans and food allergies". Journal of Experimental Botany. 54 (386): 1317–19. doi:10.1093/jxb/erg164. PMID 12709477. Archived from the original on 30 September 2013. ^ Panda R, Ariyarathna H, Amnuaycheewa P, Tetteh A, Pramod SN, Taylor SL, Ballmer-Weber BK, Goodman RE (February 2013). "Challenges in testing genetically modified crops for potential increases in endogenous allergen expression for safety". Allergy. 68 (2): 142–51. doi:10.1111/all.12076. PMID 23205714. ^ a b c d Sussman GL, Beezhold DH (January 1995). "Allergy to latex rubber". Annals of Internal Medicine. 122 (1): 43–46. doi:10.7326/0003-4819-122-1-199501010-00007. PMID 7985895. ^ Fernández de Corres L, Moneo I, Muñoz D, Bernaola G, Fernández E, Audicana M, Urrutia I (January 1993). "Sensitization from chestnuts and bananas in patients with urticaria and anaphylaxis from contact with latex". Annals of Allergy. 70 (1): 35–39. PMID 7678724. ^ a b Gonzalez-Estrada A, Radojicic C (May 2015). "Penicillin allergy: A practical guide for clinicians". Cleveland Clinic Journal of Medicine. 82 (5): 295–300. doi:10.3949/ccjm.82a.14111. PMID 25973877. ^ C. Michael Hogan. Western poison-oak: Toxicodendron diversilobum Archived 21 July 2009 at the Wayback Machine. GlobalTwitcher, ed. Nicklas Stromberg. 2008. Retrieved 30 April 2010. ^ Keeler, Harriet L. (1900). Our Native Trees and How to Identify Them. New York: Charles Scribner's Sons. pp. 94–96; Frankel, Edward, Ph.D. Poison Ivy, Poison Oak, Poison Sumac and Their Relatives; Pistachios, Mangoes and Cashews. The Boxwood Press. Pacific Grove, CA. 1991. ISBN 978-0-940168-18-3. ^ Galli SJ (February 2000). "Allergy". Current Biology. 10 (3): R93–5. doi:10.1016/S0960-9822(00)00322-5. PMID 10679332. ^ a b c d e De Swert LF (February 1999). "Risk factors for allergy". European Journal of Pediatrics. 158 (2): 89–94. doi:10.1007/s004310051024. PMID 10048601. ^ a b Croner S (November 1992). "Prediction and detection of allergy development: influence of genetic and environmental factors". The Journal of Pediatrics. 121 (5 Pt 2): S58–63. doi:10.1016/S0022-3476(05)81408-8. PMID 1447635. ^ Jarvis D, Burney P (1997). "Epidemiology of atopy and atopic disease". In Kay AB (ed.). Allergy and allergic diseases. 2. London: Blackwell Science. pp. 1208–24. ^ Anderson HR, Pottier AC, Strachan DP (July 1992). "Asthma from birth to age 23: incidence and relation to prior and concurrent atopic disease". Thorax. 47 (7): 537–42. doi:10.1136/thx.47.7.537. PMC 463865. PMID 1412098. ^ Barnes KC, Grant AV, Hansel NN, Gao P, Dunston GM (January 2007). "African Americans with asthma: genetic insights". Proceedings of the American Thoracic Society. 4 (1): 58–68. doi:10.1513/pats.200607-146JG. PMC 2647616. PMID 17202293. Archived from the original on 16 November 2010. ^ Folkerts G, Walzl G, Openshaw PJ (March 2000). "Do common childhood infections 'teach' the immune system not to be allergic?". Immunology Today. 21 (3): 118–20. doi:10.1016/S0167-5699(00)01582-6. PMID 10777250. ^ "The Hygiene Hypothesis". Edward Willett. 30 January 2013. Archived from the original on 30 April 2013. Retrieved 30 May 2013. ^ Gibson PG, Henry RL, Shah S, Powell H, Wang H (September 2003). "Migration to a western country increases asthma symptoms but not eosinophilic airway inflammation". Pediatric Pulmonology. 36 (3): 209–15. doi:10.1002/ppul.10323. PMID 12910582. . Retrieved 2008-07-06. ^ Addo-Yobo EO, Woodcock A, Allotey A, Baffoe-Bonnie B, Strachan D, Custovic A (February 2007). "Exercise-induced bronchospasm and atopy in Ghana: two surveys ten years apart". PLoS Medicine. 4 (2): e70. doi:10.1371/journal.pmed.0040070. PMC 1808098. PMID 17326711. Archived from the original on 16 November 2010. ^ Marra F, Lynd L, Coombes M, Richardson K, Legal M, Fitzgerald JM, Marra CA (March 2006). "Does antibiotic exposure during infancy lead to development of asthma? : a systematic review and metaanalysis". Chest. 129 (3): 610–18. doi:10.1378/chest.129.3.610. PMID 16537858. ^ Thavagnanam S, Fleming J, Bromley A, Shields MD, Cardwell CR (April 2008). "A meta-analysis of the association between Caesarean section and childhood asthma". Clinical and Experimental Allergy. 38 (4): 629–33. doi:10.1111/j.1365-2222.2007.02780.x. PMID 18352976. ^ Zock JP, Plana E, Jarvis D, Antó JM, Kromhout H, Kennedy SM, Künzli N, Villani S, Olivieri M, Torén K, Radon K, Sunyer J, Dahlman-Hoglund A, Norbäck D, Kogevinas M (October 2007). "The use of household cleaning sprays and adult asthma: an international longitudinal study". American Journal of Respiratory and Critical Care Medicine. 176 (8): 735–41. doi:10.1164/rccm.200612-1793OC. PMC 2020829. PMID 17585104. ^ Dave ND, Xiang L, Rehm KE, Marshall GD (February 2011). "Stress and allergic diseases". Immunology and Allergy Clinics of North America. 31 (1): 55–68. doi:10.1016/j.iac.2010.09.009. PMC 3264048. PMID 21094923. ^ a b Cooper PJ (2004). "Intestinal worms and human allergy". Parasite Immunology. 26 (11–12): 455–67. doi:10.1111/j.0141-9838.2004.00728.x. PMID 15771681. ^ Braun-Fahrländer C, Riedler J, Herz U, Eder W, Waser M, Grize L, Maisch S, Carr D, Gerlach F, Bufe A, Lauener RP, Schierl R, Renz H, Nowak D, von Mutius E (September 2002). "Environmental exposure to endotoxin and its relation to asthma in school-age children". The New England Journal of Medicine. 347 (12): 869–77. doi:10.1056/NEJMoa020057. PMID 12239255. ^ Garn H, Renz H (2007). "Epidemiological and immunological evidence for the hygiene hypothesis". Immunobiology. 212 (6): 441–52. doi:10.1016/j.imbio.2007.03.006. PMID 17544829. ^ Macpherson CN, Gottstein B, Geerts S (April 2000). "Parasitic food-borne and water-borne zoonoses". Revue Scientifique et Technique. 19 (1): 240–58. doi:10.20506/rst.19.1.1218. PMID 11189719. ^ Carvalho EM, Bastos LS, Araújo MI (October 2006). "Worms and allergy". Parasite Immunology. 28 (10): 525–34. doi:10.1111/j.1365-3024.2006.00894.x. PMID 16965288. ^ a b Yazdanbakhsh M, Kremsner PG, van Ree R (April 2002). "Allergy, parasites, and the hygiene hypothesis". Science. 296 (5567): 490–94. CiteSeerX 10.1.1.570.9502. doi:10.1126/science.296.5567.490. PMID 11964470. ^ Emanuelsson C, Spangfort MD (May 2007). "Allergens as eukaryotic proteins lacking bacterial homologues". Molecular Immunology. 44 (12): 3256–60. doi:10.1016/j.molimm.2007.01.019. PMID 17382394. ^ a b Falcone FH, Pritchard DI (April 2005). "Parasite role reversal: worms on trial". Trends in Parasitology. 21 (4): 157–60. doi:10.1016/j.pt.2005.02.002. PMID 15780835. ^ Grimbaldeston MA, Metz M, Yu M, Tsai M, Galli SJ (December 2006). "Effector and potential immunoregulatory roles of mast cells in IgE-associated acquired immune responses". Current Opinion in Immunology. 18 (6): 751–60. doi:10.1016/j.coi.2006.09.011. PMID 17011762. ^ Holt PG, Sly PD (October 2007). "Th2 cytokines in the asthma late-phase response". Lancet. 370 (9596): 1396–98. doi:10.1016/S0140-6736(07)61587-6. PMID 17950849. ^ Martín A, Gallino N, Gagliardi J, Ortiz S, Lascano AR, Diller A, Daraio MC, Kahn A, Mariani AL, Serra HM (August 2002). "Early inflammatory markers in elicitation of allergic contact dermatitis". BMC Dermatology. 2: 9. doi:10.1186/1471-5945-2-9. PMC 122084. PMID 12167174. ^ Portnoy JM; et al. (2006). "Evidence-based Allergy Diagnostic Tests". Current Allergy and Asthma Reports. 6 (6): 455–61. doi:10.1007/s11882-006-0021-8. ^ a b c d Boyce JA, Assa'ad A, Burks AW, Jones SM, Sampson HA, Wood RA, et al. (December 2010). "Guidelines for the diagnosis and management of food allergy in the United States: report of the NIAID-sponsored expert panel". The Journal of Allergy and Clinical Immunology. 126 (6 Suppl): S1–58. doi:10.1016/j.jaci.2010.10.007. PMC 4241964. PMID 21134576. ^ Cox L (2011). "Overview of Serological-Specific IgE Antibody Testing in Children". Pediatric Allergy and Immunology. ^ "CG116 Food allergy in children and young people: costing report". National Institute for Health and Clinical Excellence. 23 February 2011. Archived from the original on 17 January 2012. ^ "Guidelines for the Diagnosis and Management of Food Allergy in the United States: Summary of the NIAID-Sponsored Expert Panel Report" (PDF). NIH. 2010. 11-7700. ^ Verstege A, Mehl A, Rolinck-Werninghaus C, Staden U, Nocon M, Beyer K, Niggemann B, et al. (September 2005). "The predictive value of the skin prick test weal size for the outcome of oral food challenges". Clinical and Experimental Allergy. 35 (9): 1220–26. doi:10.1111/j.1365-2222.2005.2324.x. PMID 16164451. ^ Li JT, Andrist D, Bamlet WR, Wolter TD (November 2000). "Accuracy of patient prediction of allergy skin test results". Annals of Allergy, Asthma & Immunology. 85 (5): 382–84. doi:10.1016/S1081-1206(10)62550-1. PMID 11101180. ^ Yunginger JW, Ahlstedt S, Eggleston PA, Homburger HA, Nelson HS, Ownby DR, et al. (June 2000). 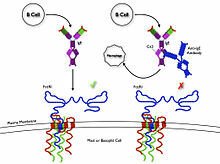 "Quantitative IgE antibody assays in allergic diseases". Journal of Allergy and Clinical Immunology. 105 (6): 1077–84. doi:10.1067/mai.2000.107041. ^ Sampson HA (May 2001). "Utility of food-specific IgE concentrations in predicting symptomatic food allergy". The Journal of Allergy and Clinical Immunology. 107 (5): 891–96. doi:10.1067/mai.2001.114708. PMID 11344358. ^ Kerkhof M, Dubois AE, Postma DS, Schouten JP, de Monchy JG (September 2003). "Role and interpretation of total serum IgE measurements in the diagnosis of allergic airway disease in adults". Allergy. 58 (9): 905–11. doi:10.1034/j.1398-9995.2003.00230.x. PMID 12911420. ^ a b "Blood Testing for Allergies". WebMD. Archived from the original on 4 June 2016. Retrieved 5 June 2016. ^ Khan FM, Ueno-Yamanouchi A, Serushago B, Bowen T, Lyon AW, Lu C, Storek J (January 2012). "Basophil activation test compared to skin prick test and fluorescence enzyme immunoassay for aeroallergen-specific Immunoglobulin-E". Allergy, Asthma, and Clinical Immunology. 8 (1): 1. doi:10.1186/1710-1492-8-1. PMC 3398323. PMID 22264407. ^ "Allergy Diagnosis". Archived from the original on 16 November 2010. The Online Allergist. Retrieved 2010-10-25. ^ Wheeler PW, Wheeler SF (September 2005). "Vasomotor rhinitis". American Family Physician. 72 (6): 1057–62. PMID 16190503. Archived from the original on 21 August 2008. ^ Greer FR, Sicherer SH, Burks AW (January 2008). "Effects of early nutritional interventions on the development of atopic disease in infants and children: the role of maternal dietary restriction, breastfeeding, timing of introduction of complementary foods, and hydrolyzed formulas". Pediatrics. 121 (1): 183–91. doi:10.1542/peds.2007-3022. PMID 18166574. ^ Fleischer DM, Spergel JM, Assa'ad AH, Pongracic JA (January 2013). "Primary prevention of allergic disease through nutritional interventions". The Journal of Allergy and Clinical Immunology. In Practice. 1 (1): 29–36. doi:10.1016/j.jaip.2012.09.003. PMID 24229819. ^ Garcia-Larsen V, Ierodiakonou D, Jarrold K, Cunha S, Chivinge J, Robinson Z, Geoghegan N, Ruparelia A, Devani P, Trivella M, Leonardi-Bee J, Boyle RJ (February 2018). "Diet during pregnancy and infancy and risk of allergic or autoimmune disease: A systematic review and meta-analysis". PLoS Medicine. 15 (2): e1002507. doi:10.1371/journal.pmed.1002507. PMC 5830033. PMID 29489823. ^ Pelucchi C, Chatenoud L, Turati F, Galeone C, Moja L, Bach JF, La Vecchia C (May 2012). "Probiotics supplementation during pregnancy or infancy for the prevention of atopic dermatitis: a meta-analysis". Epidemiology. 23 (3): 402–14. doi:10.1097/EDE.0b013e31824d5da2. PMID 22441545. ^ Sinn, John KH; Osborn, David A. (2007). "Prebiotics in infants for prevention of allergy and food hypersensitivity". Cochrane Database of Systematic Reviews (2). doi:10.1002/14651858.CD006474. ISSN 1465-1858. ^ Netting MJ, Middleton PF, Makrides M (2014). "Does maternal diet during pregnancy and lactation affect outcomes in offspring? A systematic review of food-based approaches". Nutrition. 30 (11–12): 1225–41. doi:10.1016/j.nut.2014.02.015. hdl:2440/89756. PMID 25280403. ^ Zhang GQ, Liu B, Li J, Luo CQ, Zhang Q, Chen JL, Sinha A, Li ZY (March 2017). "Fish intake during pregnancy or infancy and allergic outcomes in children: A systematic review and meta-analysis". Pediatric Allergy and Immunology. 28 (2): 152–61. doi:10.1111/pai.12648. PMID 27590571. ^ Frieri M (June 2018). "Mast Cell Activation Syndrome". Clinical Reviews in Allergy & Immunology. 54 (3): 353–65. doi:10.1007/s12016-015-8487-6. PMID 25944644. ^ a b Abramson MJ, Puy RM, Weiner JM (August 2010). "Injection allergen immunotherapy for asthma". The Cochrane Database of Systematic Reviews (8): CD001186. doi:10.1002/14651858.CD001186.pub2. PMID 20687065. ^ Penagos M, Compalati E, Tarantini F, Baena-Cagnani R, Huerta J, Passalacqua G, Canonica GW (August 2006). "Efficacy of sublingual immunotherapy in the treatment of allergic rhinitis in pediatric patients 3 to 18 years of age: a meta-analysis of randomized, placebo-controlled, double-blind trials". Annals of Allergy, Asthma & Immunology. 97 (2): 141–48. doi:10.1016/S1081-1206(10)60004-X. PMID 16937742. ^ Calderon MA, Alves B, Jacobson M, Hurwitz B, Sheikh A, Durham S (January 2007). "Allergen injection immunotherapy for seasonal allergic rhinitis". The Cochrane Database of Systematic Reviews (1): CD001936. doi:10.1002/14651858.CD001936.pub2. PMID 17253469. ^ a b c d Canonica GW, Bousquet J, Casale T, Lockey RF, Baena-Cagnani CE, Pawankar R, et al. (December 2009). "Sub-lingual immunotherapy: World Allergy Organization Position Paper 2009" (PDF). Allergy. 64 Suppl 91: 1–59. doi:10.1111/j.1398-9995.2009.02309.x. PMID 20041860. Archived from the original (PDF) on 12 November 2011. ^ Rank MA, Li JT (September 2007). "Allergen immunotherapy". Mayo Clinic Proceedings. 82 (9): 1119–23. doi:10.4065/82.9.1119. PMC 4132422. PMID 17803880. ^ Di Bona D, Plaia A, Leto-Barone MS, La Piana S, Di Lorenzo G (August 2015). "Efficacy of Grass Pollen Allergen Sublingual Immunotherapy Tablets for Seasonal Allergic Rhinoconjunctivitis: A Systematic Review and Meta-analysis". JAMA Internal Medicine. 175 (8): 1301–09. doi:10.1001/jamainternmed.2015.2840. PMID 26120825. ^ a b Terr AI (2004). "Unproven and controversial forms of immunotherapy". Clinical Allergy and Immunology. 18: 703–10. PMID 15042943. ^ Altunç U, Pittler MH, Ernst E (January 2007). "Homeopathy for childhood and adolescence ailments: systematic review of randomized clinical trials". Mayo Clinic Proceedings. 82 (1): 69–75. CiteSeerX 10.1.1.456.5352. doi:10.4065/82.1.69. PMID 17285788. ^ a b Platts-Mills TA, Erwin E, Heymann P, Woodfolk J (2005). "Is the hygiene hypothesis still a viable explanation for the increased prevalence of asthma?". Allergy. 60 Suppl 79: 25–31. doi:10.1111/j.1398-9995.2005.00854.x. PMID 15842230. ^ a b c Bloomfield SF, Stanwell-Smith R, Crevel RW, Pickup J (April 2006). "Too clean, or not too clean: the hygiene hypothesis and home hygiene". Clinical and Experimental Allergy. 36 (4): 402–25. doi:10.1111/j.1365-2222.2006.02463.x. PMC 1448690. PMID 16630145. ^ Isolauri E, Huurre A, Salminen S, Impivaara O (July 2004). "The allergy epidemic extends beyond the past few decades". Clinical and Experimental Allergy. 34 (7): 1007–10. doi:10.1111/j.1365-2222.2004.01999.x. PMID 15248842. ^ "Chapter 4: The Extent and Burden of Allergy in the United Kingdom". House of Lords – Science and Technology – Sixth Report. 24 July 2007. Archived from the original on 16 November 2010. Retrieved 2007-12-03. ^ "AAAAI – rhinitis, sinusitis, hay fever, stuffy nose, watery eyes, sinus infection". Archived from the original on 16 November 2010. Retrieved 2007-12-03. ^ Based on an estimated population of 303 million in 2007 U.S. POPClock Archived 16 May 2012 at the Wayback Machine. U.S. Census Bureau. ^ "AAAAI – asthma, allergy, allergies, prevention of allergies and asthma, treatment for allergies and asthma". Archived from the original on 16 November 2010. Retrieved 2007-12-03. ^ "AAAAI – skin condition, itchy skin, bumps, red irritated skin, allergic reaction, treating skin condition". Archived from the original on 16 November 2010. Retrieved 2007-12-03. ^ "AAAAI – anaphylaxis, cause of anaphylaxis, prevention, allergist, anaphylaxis statistics". Archived from the original on 16 November 2010. Retrieved 2007-12-03. ^ a b "AAAAI – food allergy, food reactions, anaphylaxis, food allergy prevention". Archived from the original on 16 November 2010. Retrieved 2007-12-03. ^ "AAAAI – stinging insect, allergic reaction to bug bite, treatment for insect bite". Archived from the original on 16 November 2010. Retrieved 2007-12-03. ^ Simpson CR, Newton J, Hippisley-Cox J, Sheikh A (November 2008). "Incidence and prevalence of multiple allergic disorders recorded in a national primary care database". Journal of the Royal Society of Medicine. 101 (11): 558–63. doi:10.1258/jrsm.2008.080196. PMC 2586863. PMID 19029357. ^ Strachan DP (November 1989). "Hay fever, hygiene, and household size". BMJ. 299 (6710): 1259–60. doi:10.1136/bmj.299.6710.1259. PMC 1838109. PMID 2513902. ^ Renz H, Blümer N, Virna S, Sel S, Garn H (2006). The immunological basis of the hygiene hypothesis. Chemical Immunology and Allergy. 91. pp. 30–48. doi:10.1159/000090228. ISBN 978-3-8055-8000-7. PMID 16354947. ^ Matricardi PM, Rosmini F, Riondino S, Fortini M, Ferrigno L, Rapicetta M, Bonini S (February 2000). "Exposure to foodborne and orofecal microbes versus airborne viruses in relation to atopy and allergic asthma: epidemiological study". BMJ. 320 (7232): 412–17. doi:10.1136/bmj.320.7232.412. PMC 27285. PMID 10669445. ^ Masters S, Barrett-Connor E (1985). "Parasites and asthma--predictive or protective?". Epidemiologic Reviews. 7: 49–58. doi:10.1093/oxfordjournals.epirev.a036285. PMID 4054238. ^ a b Sheikh A, Strachan DP (June 2004). "The hygiene theory: fact or fiction?". Current Opinion in Otolaryngology & Head and Neck Surgery. 12 (3): 232–36. doi:10.1097/01.moo.0000122311.13359.30. PMID 15167035. ^ Ring J. (August 1985). "1st description of an "atopic family anamnesis" in the Julio-Claudian imperial house: Augustus, Claudius, Britannicus". Hautarzt. 36 (8): 470–71. PMID 3899999. ^ Von Pirquet C (1906). "Allergie". Munch Med Wochenschr. 53 (5): 388–90. PMID 20273584. Reprinted in Von Pirquet C (1946). "Allergie". Annals of Allergy. 4 (5): 388–90. PMID 20273584. ^ Gell PG, Coombs RR (1963). Clinical Aspects of Immunology. London: Blackwell. ^ Szebeni, Janos (8 May 2007). The Complement System: Novel Roles in Health and Disease. Springer Science & Business Media. p. 361. ISBN 978-1-4020-8056-2. ^ Stanworth DR (1993). "The discovery of IgE". Allergy. 48 (2): 67–71. doi:10.1111/j.1398-9995.1993.tb00687.x. PMID 8457034. ^ Ishizaka K, Ishizaka T, Hornbrook MM (July 1966). "Physico-chemical properties of human reaginic antibody. IV. 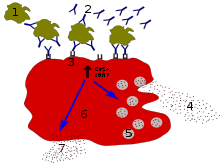 Presence of a unique immunoglobulin as a carrier of reaginic activity". Journal of Immunology. 97 (1): 75–85. PMID 4162440. ^ Johansson SG, Bennich H. Immunological studies of an atypical (myeloma) immunoglobulin" Immunology 1967; 13:381–94. ^ Ishizaka,, Teruko; Ishizaka, Kimishige; Johansson, S. Gunnar O.; Bennich, Hans (1 April 1969). "Histamine Release from Human Leukocytes by Anti-λE Antibodies". Journal of Immunology. 102 (4): 884–92. Retrieved 29 February 2016. ^ Ten RM, Klein JS, Frigas E (August 1995). "Allergy skin testing". Mayo Clinic Proceedings. 70 (8): 783–84. doi:10.4065/70.8.783. PMID 7630219. ^ "ABAI: American Board of Allergy and Immunology". Archived from the original on 16 November 2010. Retrieved 2007-08-05. ^ "AAAAI – What is an Allergist?". Archived from the original on 16 November 2010. Retrieved 2007-08-05. 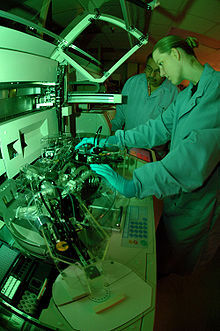 ^ House of Lords – Science and Technology Committee (2007). Allergy – HL 166-I, 6th Report of Session 2006–07 – Volume 1: Report. London: TSO (The Stationery Office). ISBN 978-0-10-401149-2. Archived from the original on 29 March 2017. ^ Sicherer SH, Leung DY (June 2007). "Advances in allergic skin disease, anaphylaxis, and hypersensitivity reactions to foods, drugs, and insects". The Journal of Allergy and Clinical Immunology. 119 (6): 1462–69. doi:10.1016/j.jaci.2007.02.013. PMID 17412401. ^ Galán, C., Smith, M., Thibaudon, M., Frenguelli, G., Oteros, J., Gehrig, R., ... & EAS QC Working Group. (2014). Pollen monitoring: minimum requirements and reproducibility of analysis. Aerobiologia, 30(4), 385-395. ^ Oteros J, Galán C, Alcázar P, Domínguez-Vilches E (January 2013). "Quality control in bio-monitoring networks, Spanish Aerobiology Network". The Science of the Total Environment. 443: 559–65. doi:10.1016/j.scitotenv.2012.11.040. PMID 23220389.